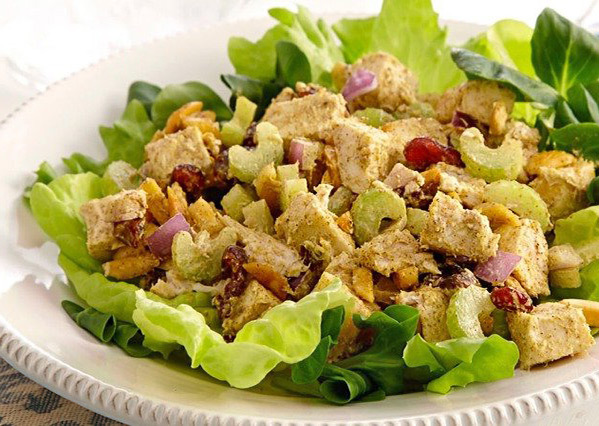 This chicken salad with the sweet crunch of grapes is wonderfully easy and delicious. It serves a lot of people. I can’t tell you exactly how many, because I never measure the ingredients very carefully. All of the ingredient amounts are pretty forgiving, so you can use as more or less meat/fruit if you like. Also, I make this recipe with low-fat/fat free mayonnaise, yogurt and sour cream, and it turns out great. I highly recommend Hellman’s mayonnaise. Mix the cumin and the yogurt together, place the chicken on a sheet pan and spread the yogurt liberally on the chicken, there may be leftover yogurt, the goal is to coat the chicken with the yogurt so that the chicken does not become crisp at all on the outside. Bake the chicken (with the yogurt spread over it) at 350F until the chicken is cooked through. This will take between 20 and 40 minutes. Mix the celery, grapes, apples and lime juice. I actually dip the apples in the lime juice to keep them from turning brown. Let the Chicken cool before cutting it up into cubes, or the meat will fall apart. Cut it up into ½ inch to 1 inch cubes and add it to the bowl. Then add half sour cream and half mayonnaise until everything is coated to your liking. You may end up using less than the recipe calls for. Finally add the curry powder to taste, the salad ought to turn a light yellow color, I keep adding it until the salad has just a little kick to it. Which usually takes at least 2-3 tablespoons. Can be served with cashews on top, and/or strawberries.